Apple is improving its existing iPad Pro keyboard today with an update for the latest model. The new Smart Keyboard Folio magnetically attaches to the new iPad Pro and protects the front and the back. It also now includes two angles instead of the single one on the existing keyboard. It appears that the keyboard will be a lot easier to slide into place. The original Smart Keyboard debuted three years ago with a design that acted like a cover and folded out into a keyboard. Apple used a Smart Connector on the iPad Pro previously to connect this keyboard, but the new magnets feature should make this easier to use. Apple is increasing the price of this keyboard to $179.99 for the 11-inch model and $199.99 for the 12.9-inch version. Second angle for the new Smart Keyboard Folio. “No other device can adapt to your needs the way iPad can,” says Jon Ternus, VP of hardware engineering at Apple. That’s a bold claim that largely ignores Microsoft’s range of Surface tablets that have offered a combination of stylus, touch, and keyboard / mouse input for years. We’ll need to test this particular keyboard to see if it’s as good as Microsoft’s Surface Type Cover. Still, it’s clear Apple is getting closer to a more workable keyboard for its iPad. Much like the Surface, the original iPad Pro keyboard shipped with a single angle, which was awkward to use. 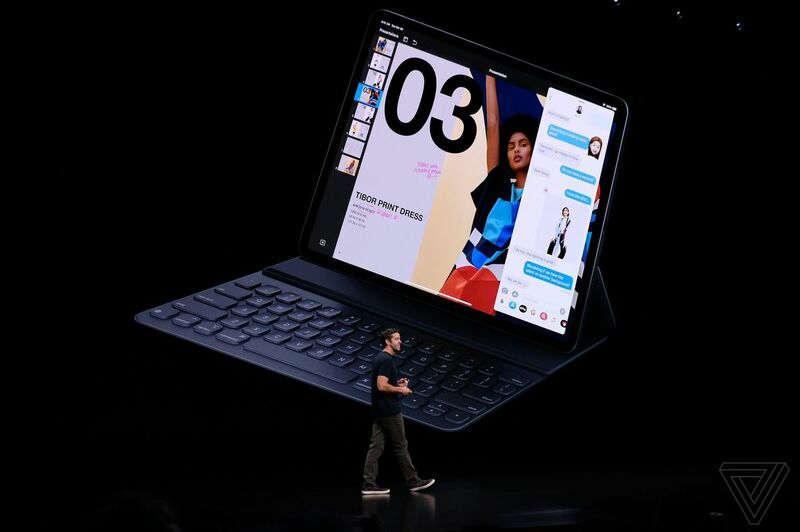 This new second-generation keyboard follows the path of the Surface Pro 2, which added two angles, so hopefully Apple’s future third-generation model will include multiple angles just like the Surface Pro 3.